Why are longer jointer tables better? Hello all I’ve been lurking for some time now but this is my first post here. I’ve read a number of posts talking about jointers and many recommendations from people who say to buy the longest tables you can afford or have space for. I totally understand how a longer table or a roller support would make it safer to handle a longer board but I just can’t conceptualize why longer tables are needed to reliably joint longer boards. I have read a few explanations about this but I didn’t really find them that clear to be honest. Can someone offer a simple example of a situation where a short jointer would not give you good results due to the table length? Longer jointer beds give a better reference surface to straighten lumber. This is especially true of the infeed table. Remember you are jointing rough lumber that is sometimes bowed. Not only are longer beds helpful for more accurate milling, but they also let you joint longer boards with ease. I think the overall length on my 8” jointer is about 74” and that’s perfect for the work I do. I used to have a 6” jointer that was much shorter, and it was very difficult to mill long boards. It’s about how much of the board is able to register on the tables. You’re thinking it’s just for support but that’s not it’s only purpose. Edit: even if you had indeed/outfeed rollers, it makes it easier to handle stock but it doesn’t give you a continuous flat surface to register stock against. I went with a Jet 8” instead of a Powematic because the length was shorter and I needed to make it more maneuverable in my garage. Now I know why the PM was longer and sometimes wish I went with that one instead. The difference in space is not that significant and the mobile base I made is great and pivots easily. For longer boards, the longer tables would be more accurate with fewer passes. But for most work I am doing, it is fine. Fridge is right, the length gives you a longer flat surface to maximize the straight edge, it is not about support. If you have a board that needs that mush support, then you need something bigger. They will only work better if they are flat and coplane.If they are not you will have to make up the difference will skills and know how. This is the reason a used jointer is sometime a better choice then new since you can inspect the tables before you haul it home. With a reliable straight edge. If you think about it in reverse, how well would a 4” jointer straighten a board? Not very well. I’ve got an old Jet JJ-6 that I’ve had forever. Not especially long, but I joint 80” door stiles on it all the time and they come out perfectly straight. As long as you support the full length of the board level with the bed of the jointer, it doesn’t matter how long it is. Longer beds just make that job easier. Thanks for all the responses. I see what your all saying about the longer tables bring a better reference. So if I was trying to joint a bowed 8’ board on a jointer with a 48” overall length would it be impossible or just really frustrating? I guess what I still don’t get is why so much of the board needs to reference the table at one time especially considering that guys using hand planes only have about 20-24” of reference. You can only effectively joint a board that is roughly twice the length of the infeed and outfeed tables combined. So if I was trying to joint a bowed 8’ board on a jointer with a 48” overall length would it be impossible or just really frustrating? I guess what I still don’t get is why so much of the board needs to reference the table at one time especially considering that guys using hand planes only have about 20-24” of reference. It wouldn’t even be frustrating. It’d be easy, and it really doesn’t matter if it’s bowed or not, that will just affect the amount of wood you remove and is a good reason to choose carefully at the lumber yard. My Jet JJ-6 is 42” long and, like I said, I’ve jointed literally hundreds of 80” residential door stiles. Just set up in feed and out feed support rollers and it’ll be easy. Good analogy on the hand plane jointer. You are precisely correct. Obviously, when it comes to a jointer, bigger is better. Get whatever you can afford and fit in your shop. Ok thanks for the advice and info. Im in the market for a used jointer and I’m sure I’ll be back with more questions. Curious… would the shorter bed actually remove more from the board before it is flat? Or is it that the angle will change each time you make a pass because the back of the board will rise as you slide left to right? 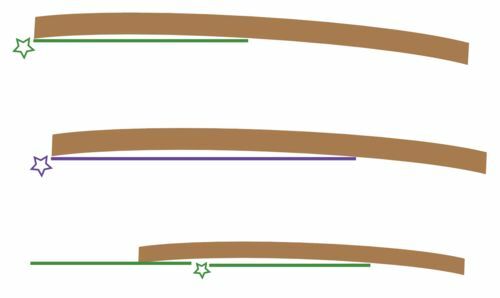 The green is a short table, purple is longer. Also, would it matter less if you flipped this over to joint the other side? I run it belly facing down. If for some reason I have to run it like in the above pics I’ll knock the ends down so it doesn’t hang below the table. Even running it like that you’ll eventually get it straight. You should joint boards with the concave side down as pictured. Otherwise the board can rock and you’ll lose your reference surface. There are exceptions to every rule, but it usually holds true. You should joint boards with the concave side down as pictured. Otherwise the board can rock and you ll lose your reference surface. There are exceptions to every rule, but it usually holds true. I’ve always heard that too, but if you’re careful to keep the pressure on the flat part that gets created pretty quickly, then it doesn’t rock. I try to keep it concave side down, but sometimes there isn’t a choice, so learning how to manage it convex side down is worthwhile.